Porsche Motorsports has made the decision to discontinue the Cup dash and center gauge panels. Demon Speed has created a new panel which replicates the original as closely as possible both with material and graphics. Whether you have a damaged dash panel which has been modified with additional switchs or if it is just scratched up over time and you would like to have a nice fresh look. Or, if you would like to modify your switch panel and you would like to keep your original safe while you buy one of ours to modify. 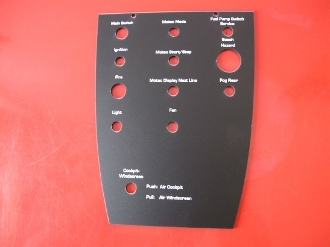 The 996 center switch panel does not have graphics originally, so we have made it two different ways. One with no graphics and one with graphics similar to the 997 switch panels.